The viewing area is dealing with bitter cold this morning. * WHAT...Very cold wind chills in the 25 below zero to 35 below zero range. The cold wind chills will cause frostbite in as little as 30 minutes to exposed skin. * WHERE...central and southern Minnesota and far western Wisconsin. * WHEN...Until 10 AM CST Friday. PRECAUTIONARY/PREPAREDNESS ACTIONS... A Wind Chill Advisory means that cold air and the wind will combine to create low wind chills. Frost bite and hypothermia can occur if precautions are not taken. Make sure you wear a hat and gloves. * WHAT...Very cold wind chills expected. The cold wind chills will cause frostbite in as little as 30 minutes to exposed skin. Expect wind chills to range from 20 below zero to 30 below zero. * WHERE...Parts of Northwest and North Central Iowa. * WHEN...Now to 10 AM this morning. PRECAUTIONARY/PREPAREDNESS ACTIONS... A Wind Chill Advisory means that cold air and the wind will combine to create low wind chills. Frost bite and hypothermia can occur if precautions are not taken. Make sure you wear a hat and gloves. * WHAT...Expect wind chills of 20 below to 30 below zero. 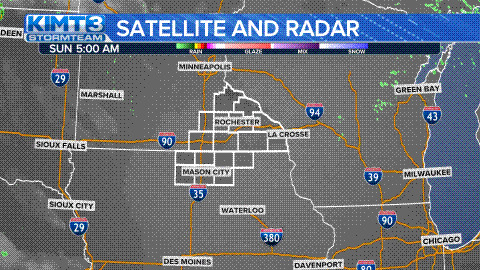 * WHERE...Portions of northeast Iowa and southeast Minnesota. * WHEN...Through 10 AM Friday. * ADDITIONAL DETAILS...The cold wind chills will cause frostbite in as little as 30 minutes to exposed skin. PRECAUTIONARY/PREPAREDNESS ACTIONS... A Wind Chill Advisory means that cold air and the wind will combine to create low wind chills. Frost bite and hypothermia can occur if precautions are not taken. Make sure you wear a hat and gloves.